first guest contributor to the Fleischer Studios website! 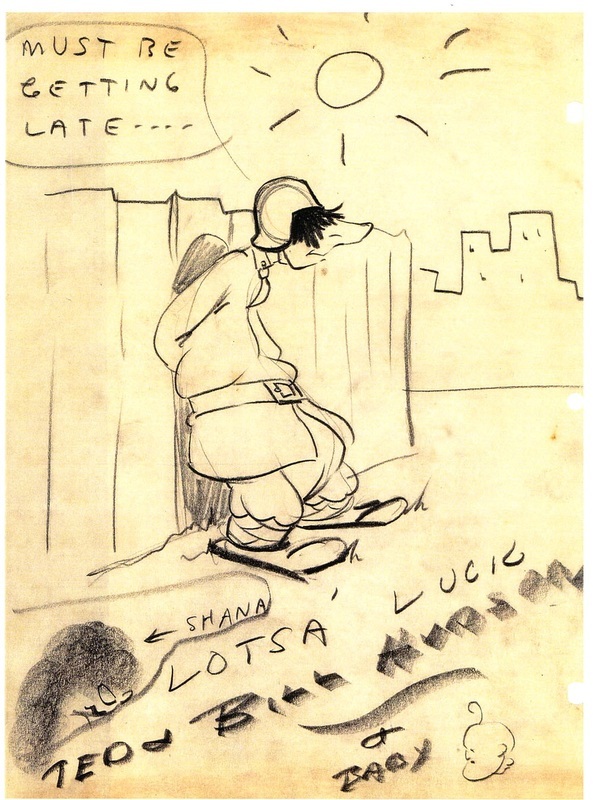 With the onset of World War 2, many of the Fleischer Studio animators voluntarily enlisted into the service. Among them was Jacob Ozarkowitz, who in March 1942, left his job as animator at the Fleischer’s Miami studio to join fellow animators working at the New York Army Signal Corps unit. The son of immigrant Russian Jews, Jacob was known around the studio as Jake. He shortened his last name to Ozark and his future wife Shana, who hated the name Jake, persuaded him to make the change to Jack. Ozark’s most notable work was for the Fleischer Studio from March 1936 until leaving for the service. 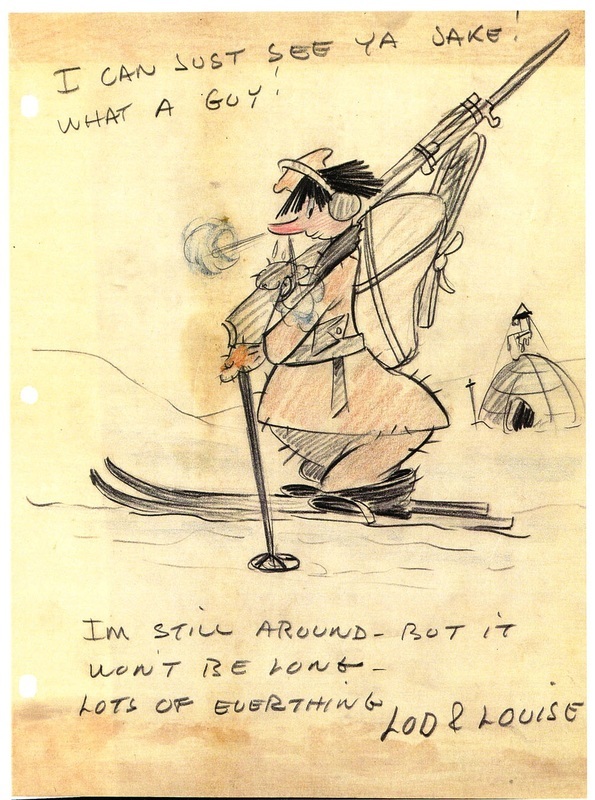 He animated for the Willard Bowsky and Tom Johnson units. Despite working on two features and many shorts, all of Ozark’s work was uncredited except for one Animated Antic, ‘The Wizard of Arts’. Sgt. 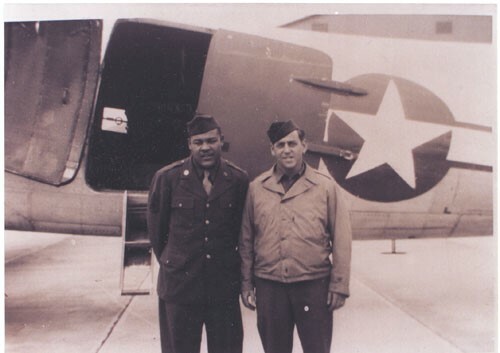 Jack Ozark with heavyweight boxing champion Joe Louis. The photo was taken in 1943 at the army base at The Pas, Manitoba, Canada. Upon arrival at the Signal Corps, Ozark was given an intelligence test that stopped short his stay. The results revealed that he had close to a genius I.Q. Taking advantage of Jack’s brainpower, the army decided to station him in northern Canada as a code breaker. 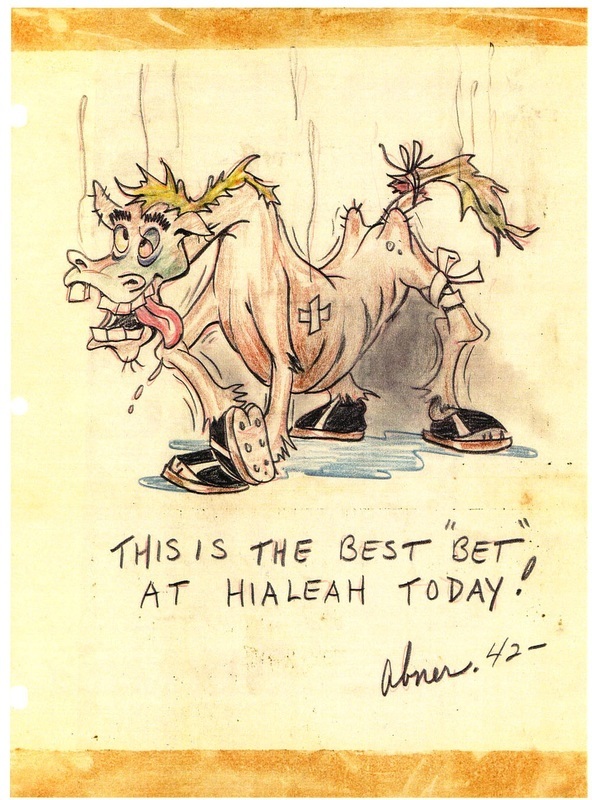 While posted there, his fellow colleagues back in Miami put together well wishes in the form of gag cartoons – a sampling of those represented here. In true animator fashion the gag cartoons were packaged in a unique way. Note the brown stained strips at the edges of each cartoon – those stains were where the pages were attached together end to end and rolled onto a cardboard tube creating a huge roll of cartoon toilet paper. The idea was that Jack, in times of need, could tear off a sheet, read, use, and dispose of it. It seems the Fleischer animators knew the true meaning of ‘toilet humor’. ​Ozark’s code breaking work was top secret so no one, including his wife, knew where he was stationed - hence the speculation of location in some of the cartoons. 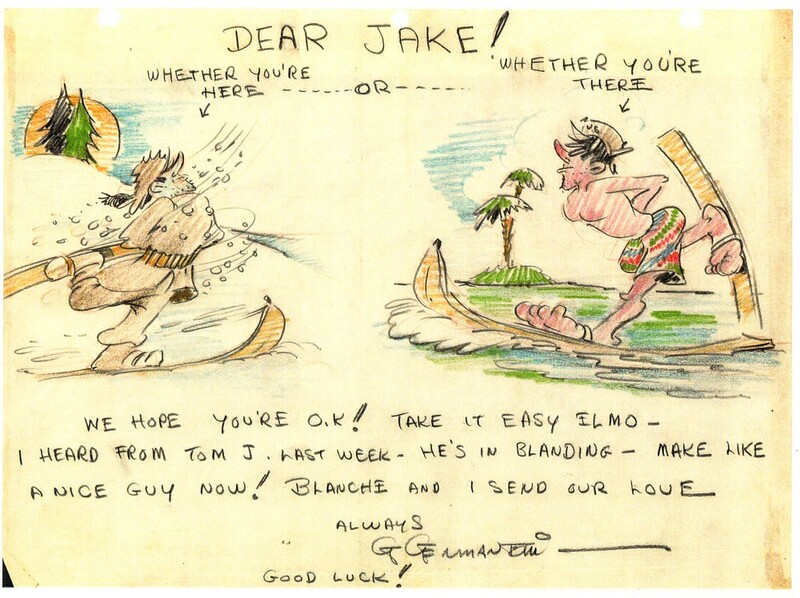 Drawing by animator George Germanetti. Ozark was Germanetti’s assistant before being promoted to animator. Drawing by animator Lod Rossner. Rossner animated for a time in the same units as Ozark and has giving indication here of leaving the studio. 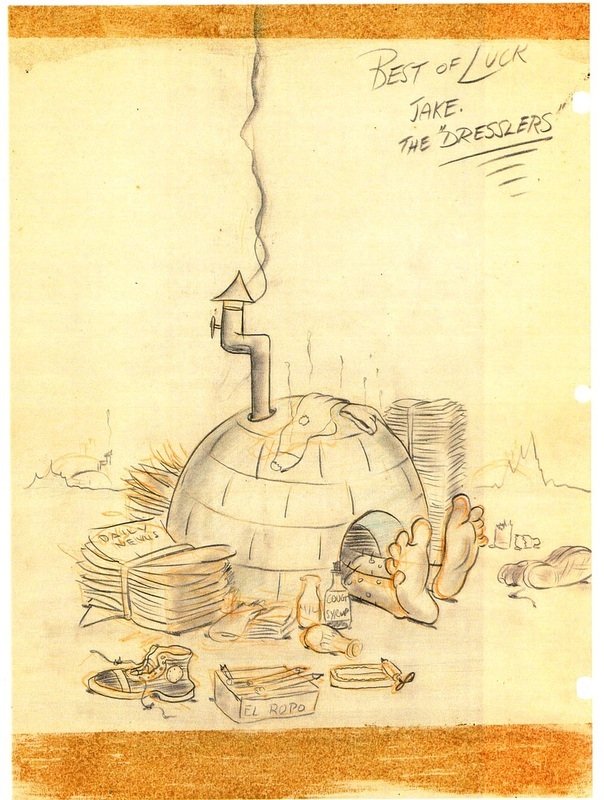 After his work at the Fleischer Studio he seems to have disappeared from the business. 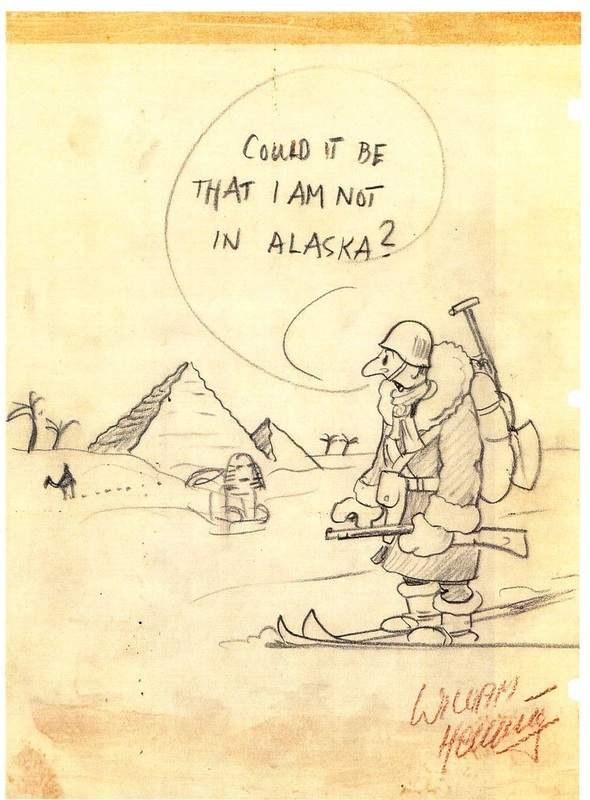 Drawing by animator Irv Dressler. Drawing by animator William Henning. Drawing by animator Bill Hudson. End Note: When Jack Ozark left in 1942 to serve in the military, Fleischer Studios itself was in the midst of major changes, and would soon be re-formed as Famous Studios. Most of the original Fleischer animators remained and became employees of Famous Studios. ​Bob Jaques would like to thank the late Shana Ozark (Jack's wife) for sharing her anecdotes with him. Wartime Gag Cartoons copyright © 2016 by Bob Jaques. All rights reserved. The images and written content contained in this exhibit may not be reproduced or used in whole, or in any part, without the express written permission of the author.